The Hull Pixelbot is a small robot that was born in Hull. It carries pixels, so it is a pixelbot. It is designed to be simple to build, fun to play with and, above all, cheap to make. The chassis is made from 3D printed parts and the electronics and motors needed to get a robot up and running can be purchased for less than 10 pounds. You can use it anywhere you need a tiny, mobile, pixel. It’s a great way to explore programing and robotics. If you want to take fun photographs you can use it to spice up the lighting in them (the pixels can be very bright) or take long exposure photographs and make snazzy light trails. We’ve got people trying to make a robot that will seek out the lightest part of a room, others trying to map out an area and some just getting together for the fun of building something. 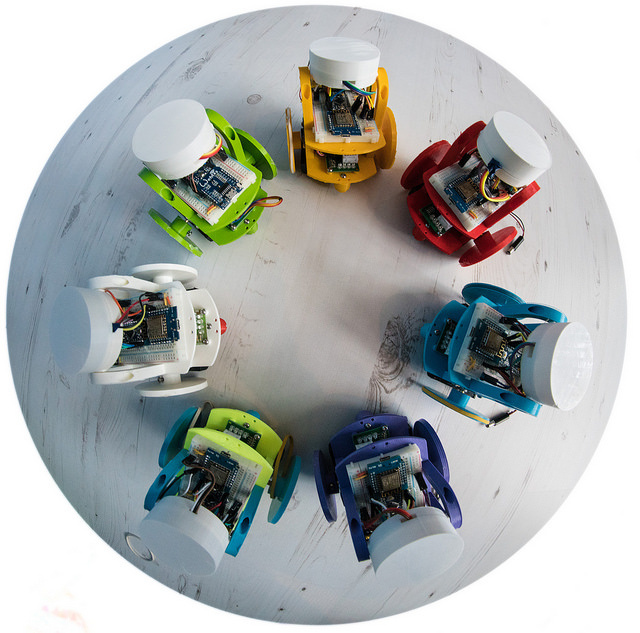 It is a great way to get started working with electronics, computing and robotics. For techie details you can find an overview of the Hull Pixelbot design in the documentation folder which you can find here. You can follow @hullpixelbot for pixelbot news.